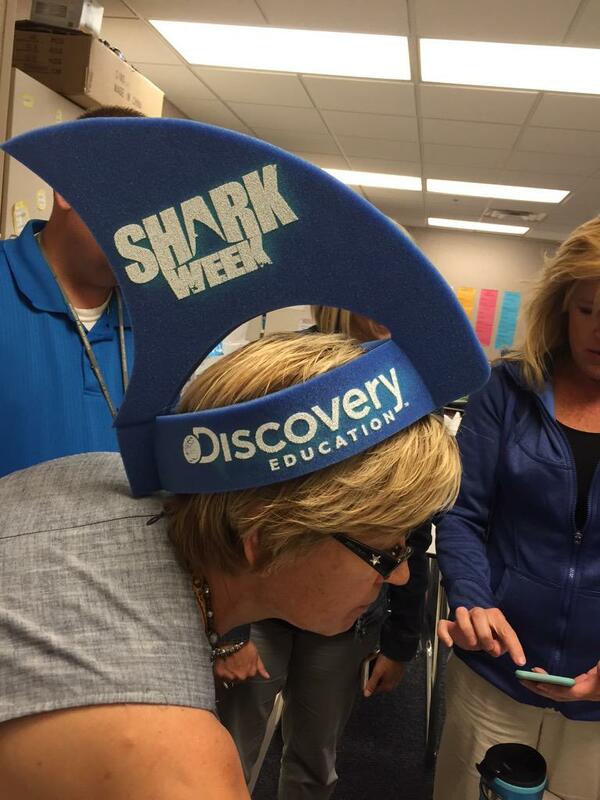 South Spartan teachers began their Monday by participating in the Spartan Scavenger Hunt. 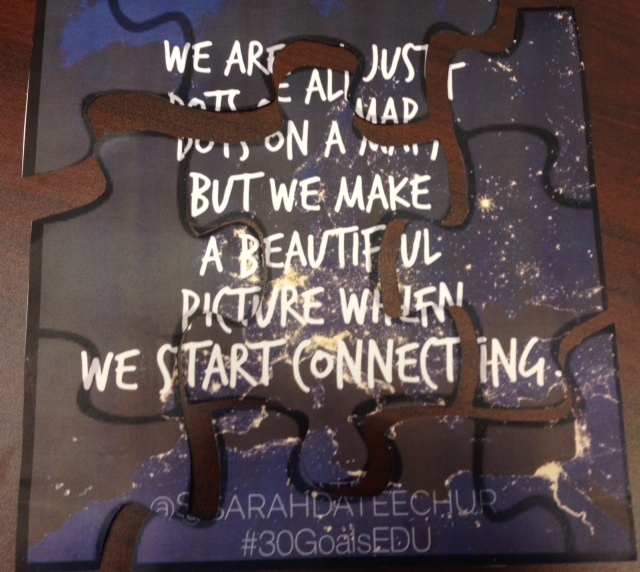 Teachers were divided into groups by putting a puzzle together. Once together the pieces were turned over to use a QR code to find their next location. With over 12 new staff members I thought this would be a great way to get to know each other as while navigating the halls of South Middle School. Eleven stations were setup around the school with different activities. Some of the stations had teachers using Google Docs, Today's Meet, Fotobabble, Discovery Education videos and Spotlight on Strategies, Twitter, Padlet. They also created a Paper Slide Video telling about their summer and used an App called Split Lens 2. My number 1 goal was for our new and veteran teachers to begin to build relationships. It is so important for everyone to feel like they belong. South Middle School is a great place to call home from August through May. We are a great staff that works hard for our students. Once a Spartan Always a Spartan. What do teachers do in the summer? We gather to discuss books we've been reading. Last Thursday several gathered on my deck to eat a few apps, have a beverage, and discuss books we've been reading. Many came with an armful of books to discuss and share with others. We talked about professional books such as What Connected Educators Do Differently by Todd Whitaker, Jeffrey Zoul, and Jimmy Casas. 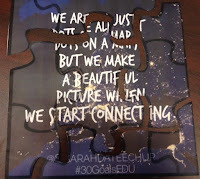 Several of us shared how connected educators give of themselves, pay it forward, have a drive to be better, and are at the forefront of change. A few of us recently ordered Alice Keeler's book 50 Things You Can Do With Google Classroom. A great book that gives practical and relevant ideas for using Classroom in your room this Fall. Of course my favorite book was talked about Teach Like a Pirate by Dave Burgess. We all need to have the attitude of a pirate...daring and adventurous in our classrooms. We also talked about Penny Kittle's book Book Love and Donalyn Miller's Book Whisperer as great books to help teachers understand the importance of students having choice in the books they are reading in the classroom. This helps to build reading capacity for our students. A fun conversation took place about books earmarked for The Global Read Aloud for this Fall. Everyone agreed that Fish in a Tree by Lynda Mullaly Hunt will be an excellent read aloud book for students from grades 4th-8th grade. Fish by L.S. Matthews is an older book that has a theme of survival. We questioned why this book was picked but believed there was more to the story. One HS teacher took the book home to read. Within a day she gave us her thoughts on the book. She said the book is an allegory. The journey of people through life's difficulties and how they rely of hope symbolized by the fish. This book could actually be used with juniors in HS as another resource for students understanding of an allegory. Thanks to Eileen Zygarlicke for her thoughts on Fish. The important part of our job is to build relationships with our students. My goal of having a book party was not only to discuss books but to build relationships amongst the many talented professional teachers we have in our district. I hope to have another book party on my deck this summer....so happy reading! 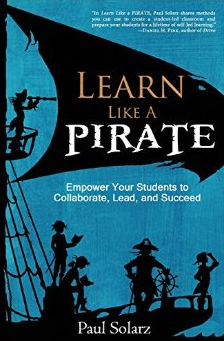 Learn Like a Pirate-Great Book! Is your classroom student-led or teacher-led? If you look around your room, is it setup for you to be the Queen or King of your classroom. Do you make all of the decisions for your class? Paul Solarz's book Learn Like a Pirate gives practical ideas and thoughts on how to begin to build a student-led classroom. Paul starts out his school year letting students know we're not just a class; we're a crew! We're in this together. The goal for his students is to learn how to work as a member of a team who supports and helps one another. He believes that collaboration s the cornerstone of a student-led classroom. Collaboration involves thinking about other people's ideas and synthesizing them with their own. True collaboration causes students to think differently. Paul empowers his students to be active leaders not passive followers. How does he do this? He provides learning opportunities for students to practice the necessary skills until they become habits. Learn how to empower your students.....read this book...it's a great read. Inspired by Jodi Dodson's Facebook post asking if anyone had picked a word, I have decided on Purpose. 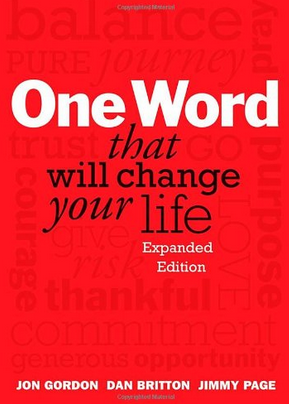 The idea of choosing one word as a goal/resolution for the year is based on a Book called One Word that will change your life. 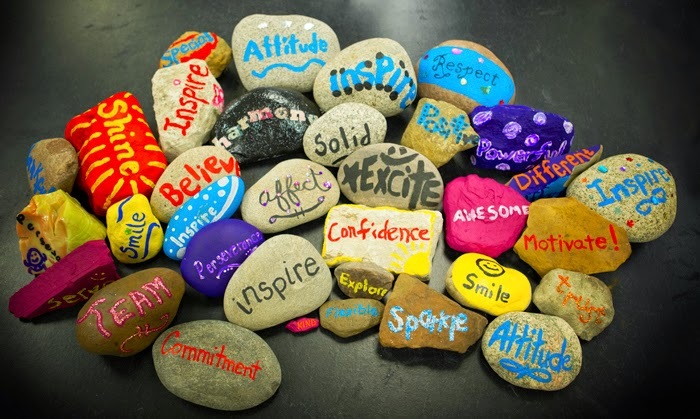 The books talks about focusing on just ONE WORD for the entire year. I so often want to change so many things in my life, but choosing only one word will hopefully help me to be more focused for work and my personal life. 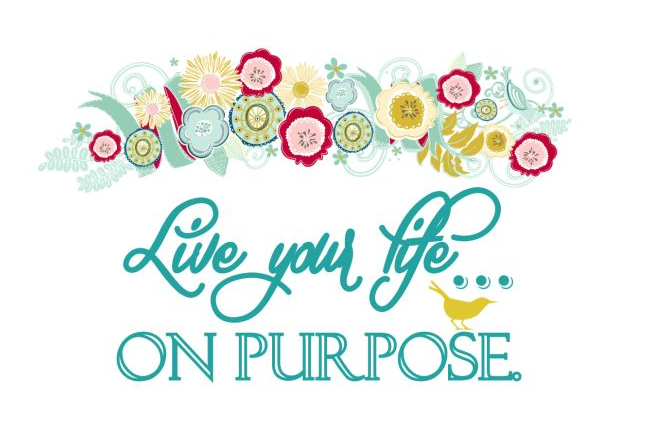 The reason I chose Purpose was for two reasons. First, does this idea/project have a purpose? Will it help teachers and students? Second, I want to be more purposeful in my follow-through with work projects and personal situations. What will be your word for the year? 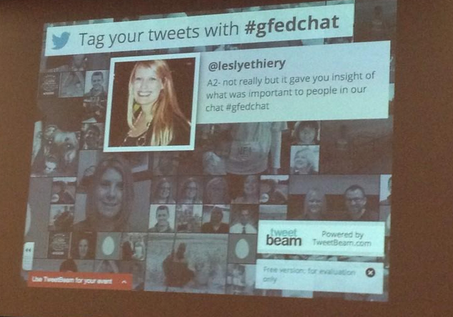 We just completed our 2nd week of #gfedchat last night while at our state technology conference in Minot. Several members of the technology team sat at two tables in the Grand Ballroom while Grand Forks teachers joined us from the comfort of their homes. We also had several from around the state join in the conversation. In addition to that we had the twitter feed shown to others at the social using Tweet Beam. Our topic last night was The Power of Digital Media. We talked about using images to focus, spark conversations, and guide attention. Examples of images were shared and discussed by nearly 40 people. One of the questions asked....How can an image be used with Ss to help them connect and learn? and visualize? Jesse Erickson from Kelly Elementary had a great comment..."Images can also provide some background knowledge or instructional hook"
I believe that digital media helps students to connect and learn by using images, audio, and video. Eric Sanders from Red River...."Picture with quote gives the presenter a chance to tell a story - a story resonates with the audience"
Use images to tell a story that provides information...make your classroom an active place for your students. A great discussion continued with the group until 9:30. 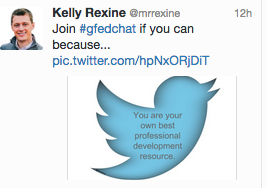 Thanks everyone for joining #gfedchat. It is a great way to collaborate and share with others...it also helps you build your PLN. DENSI-Wow, what an amazing time! I have been home for a few weeks after an amazing experience at DENSI! I attended Discovery Education's Summer Institute in Nashville, TN from July 13-18 on the campus of Vanderbilt University. It was fun to live on the 12 floor (not so fun when the elevator wasn't working) in the dorm and have suite mates. We stayed up way too late and shared 1 bathroom for the 5 of us. However the experience in the dorm provided time (just like in college) to have conversations with educators from Idaho, Tennessee, and California without even being in a planned session was an extra perk. 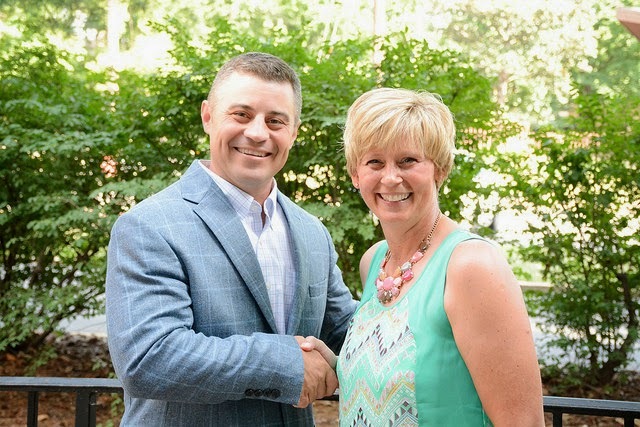 My press release photo with Lance Rougeux, a member of the Discovery Educational Professional Development Team. On our opening night we heard how the team from Discovery Education all work together to make sure DEN (Discovery Education Network) stays true to their mission of connecting educators to the most valuable resource….each other. From Sunday when we started meeting other DEN educators to now...it really has not stopped as I am connected with 150 people on Edmodo and Facebook. The questions keep being asked and answers keep being answered from colleagues from all over the US, Canada, and now the United Kingdom. I am so thankful to Discovery Education for treating us to a week that included an all day excursion, gifts each day, incredible speakers, awesome sessions, The DENmazing race through Vanderbilt, a Maker Faire room, but the best gift was the connections made with other DEN stars. Look for upcoming posts to hear more about sessions, speakers, and the Maker Faire movement. Wow! What an incredible weekend for 300 attendees of the first ND Google Summit. Google Certified Teachers Monica Martinez, Ken Shelton, Rushton Hurley, and Mark Hammons did a great job headlining the conference. My head was spinning by the end of day 2 with inspirational thoughts and ideas to bring back to share with teachers. This past weekend's technology conference provided everything you need to change your teaching. We all need to continue to grow and learn. If you are thinking I don't need to change..…I am a successful teacher. You are wrong! Does your doctor stop learning new ways to treat patients? We as educators need to continue to learn. You cannot wait for the district to provide you with learning opportunities…you need to take control of your own learning. North Dakota Google Summit next June in Grand Forks. It's not just the tech tips that come out of a technology conference, it's also the inspirational keynote speakers like Ken Shelton who talked about Engagement, Creativity, Fun, and how one minor change can make a difference in your day for your students. When Life Puts You in a Time Out.